What do visionaries, philanthropists and entrepreneurs have in common? They were all students once. At EF Education First, we believe every learner has the potential to change the world—but first, they need to experience it. For more than five decades, we’ve partnered with educators to translate this vision into meaningful international opportunities. And together, we’ve turned the world into a classroom for millions of students, inspiring the kind of global mindset our future depends on. 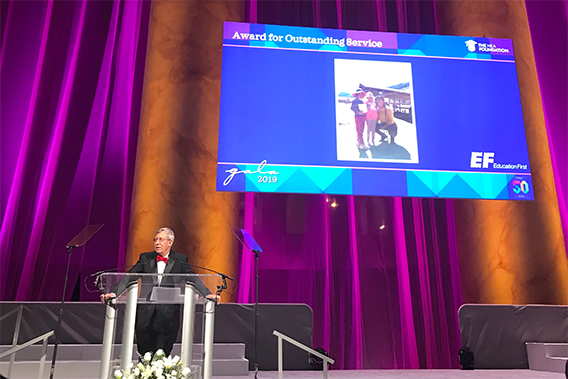 On February 8, 2019, in the presence of more than 850 U.S. leaders and public education supporters, EF was honored to be recognized by the NEA Foundation for our contributions to public education and global learning. Following in the footsteps of educational game-changers, including former President Bill Clinton, Mister Fred Rogers, Billie Jean King and Sesame Street Workshops, EF was named the 2019 recipient of the NEA Foundation’s highest honor—The First National Bank of Omaha Award for Outstanding Service to Public Education. The award was presented at the Foundation’s annual Salute to Excellence in Education Gala in Washington, D.C. Among the evening’s fellow honorees were 46 of America’s most dedicated public school educators, who were nominated by their peers for teaching excellence. For the past eight years, EF has been proud to partner with the NEA Foundation, one of the nation’s foremost public charities and champions for improved public education. In collaboration with the Foundation’s Global Learning Fellowship Program, we’ve developed international field-study experiences for K-12 public school educators seeking to bring more of the world into their U.S. classrooms. Since 2011, we’ve sent more than 100 NEA Foundation Fellows on professional development tours to China, Brazil, Peru and South Africa. As part of their travels, the teachers participate in service-learning activities at local schools, businesses and nonprofits. One such nonprofit, Peru’s Challenge, will benefit from a $5,000 charitable donation made by the NEA Foundation on behalf of EF. EF plans to send NEA Fellows back to Peru in 2020, where a new cohort of public school educators will have the opportunity to experience the nonprofit in action.